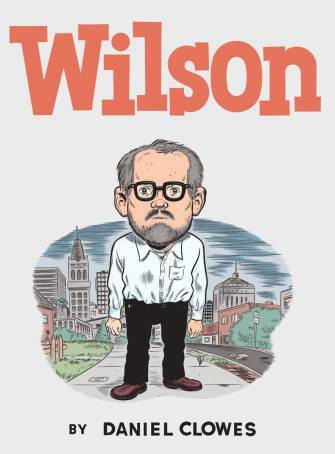 Wilson is a sharp strike right to the sweet spot of the brain where great comics are enjoyed; it's a late, great start to a 2010 that felt slightly quiet after the rush to publication by book like Footnotes In Gaza in the waning days of 2009. Like all the great steps forward in Clowes' long career, it mixes a fairly straight-forward reading experience with a skein of smartly-applied formal techniques that tease at what we're seeing, growing in clarity and force until they ultimately transform the book into a powerful meditation on a subject at which the reader of the first few pages could only guess. 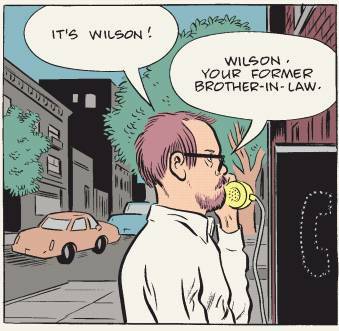 It's Clowes being Clowes, and Wilson all by itself makes 2010 a pretty good year for comics no matter what happens from here on out. Wilson tells the story of a sad-looking man of indeterminate years and limited economic means. He seems completely alone despite constantly engaging people. The more these encounters turn into Wilson cutting into some perceived vulnerable area, sometimes one of his own creation and always to a hilarious end, the more it becomes understandable why no one's remained close to the guy. Each page Clowes presents is its own discrete unit. This makes the realization that we're learning more about the character and then following him through some sort of narrative progression surprising on a gut, structural level. It also gives Clowes a chance to get in and get out about which film and stage can only dream, allowing us prolonged exposure to a character that another medium would try to soften or find intolerable. The second sustained formal choice Clowes makes that comes into play is that each of the comics is done with a slightly different attention to style. I think discerning the intention behind that choice will be the hook for comics book club meetings, Internet chats and convention dinners for months if not years to come. My gut is that the author intends it as commentary on just how difficult it is to "know" a character or more generally get at truth through art, but I'm open to having my mind changed and imagine I will. I think most people will end up processing the intentional shifts just like they might unintentional ones; I know I did. There's an even more showy formal choice that breaks the narrative about two-thirds of the way through Wilson. As effective as that one turns out to be coming on the heels of so many others, my memory of the book's latter portions have more to do with the humanist aspects that come increasingly to bear. Magnificently clueless and obviously self-defeating, willing to accept answers to life's questions that might have the rest of us scrambling for a brand new set of inquiries, Wilson's desire to engage and find some place for himself became affecting in a way I never would have guessed reading ten of those early punchlines in a row. Clowes is careful not to let his character find unearned change, and our hero is letting loose with fanciful nonsense almost up to the final one-pager. But when Wilson says things like "Christ, it's unbelievable how you go from feeling young to old in a few short years" it's hard not to agree with him, and maybe even connect to something that's also true of ourselves.